We won't live in fear, and that's the reason we're here. Can you afford to pay the price for Ronald Reagan? He sends you to die, will you never ask why? Margaret Thatcher's just as bad with you M.O.D.s! Can't you find your senses, help us shift the fences. Then we'll share the Common, and we'll all be friends. We will take the convoy you can all go away. We will see it safely back to U.S. of A.
have a lovely day now, then be on your way now. You'll be home in time for Christmas Day. Women unite, 'cos only men want to fight. 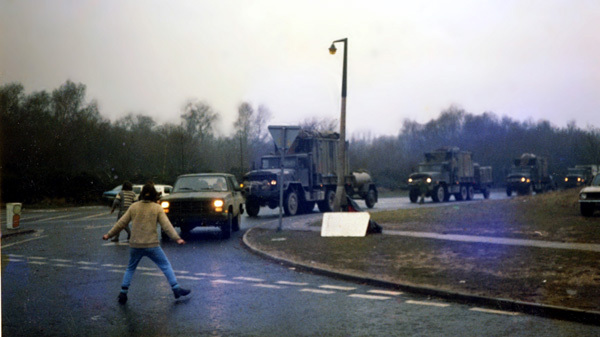 Photograph of Greenham protesters trying to stop a military convoy off for war games in Salisbury, 1989, added by Holger Terp.